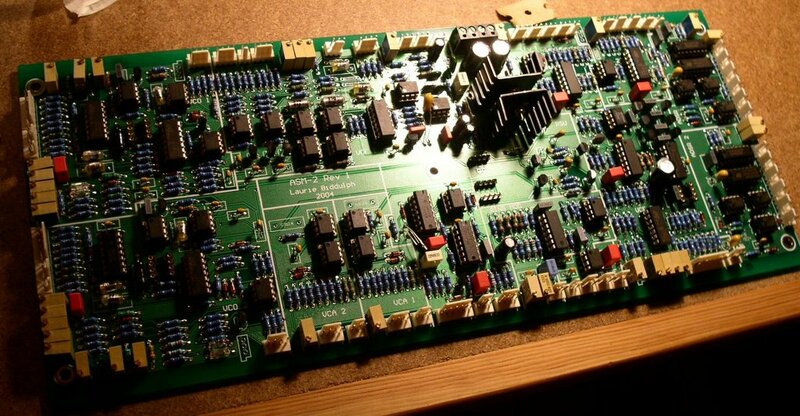 While saving up for the front panel and front panel components, I thought I'd post a pic of the PCB, 99.9% populated. And yes, I'm fully aware that the tantalum capacitor in the Noise circuit and the transistor in the S&H circuit aren't supposed to be that way - I fixed a few errors I made and had to do like that. Hopefully they'll work. Actually, I'm pretty nervous and I'm constantly getting thoughts like these: "what if the finished synth doesn't work? Then I've spent 1500 USD and an awful lot of time on nothing.". Sure, there's a risk that nothing will work ('cause of my poor skills =D ), but if that's the case then I'll just send it back to Laurie at Elby Designs and pay him to repair it. It would be pretty costy, but I want it to work! So, I'm selling my Juno-60 to fund this project. I've already sold a TR-606 and a Microcon II, but I think it's all totally worth it if it all works out fine.